“Praying Your Church Into Her Glorious Destiny” is an excellent resource on how to become an excellent vessel to be used by God as a flag bearer. A flag bearer in her primary role is an intercessor on behalf of others. Amelda Thomas-Jones is a mature, fervent and effective prayer warrior. She filled this book with rich truths and nuggets to help grow the reader spiritually. This book is available at www.faithint.org/supportus. In “Praying the Attributes of God”, Rosemary Jensen condenses many of God’s attributes into one book. The author organizes scriptures in a manner so that the reader can clearly see the attributes of God. As a flag bearer, this book is helpful in learning more about the one true God to whom you are showing reverence. In knowing more about who God is, the flag bearer is better prepared to speak the truth to God and seek His face. This book is available at Amazon.com. In “The Names of God”, Lester Sumrall let’s the reader know who God is by each of his names. As flag bearer it is essential for the flag bearer to know what God is capable of doing. It is also good for the flag bearer to know the power he or she has access to through prayer. This book is available at Amazon.com. 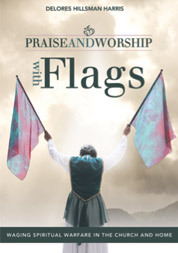 After reading Delores’ book, I now understand the purpose and power of flags in worship, and so will you. -Bishop Geoffrey V. Dudley, Sr., D.Min.